I made one gigantical cookie for your face and maybe that of a friend. A reeeeeeeal good friend. One that picks you up when you’re down and makes you laugh so hard you have to pee. One that always offers to drive and brings you soup when you throw out your back. 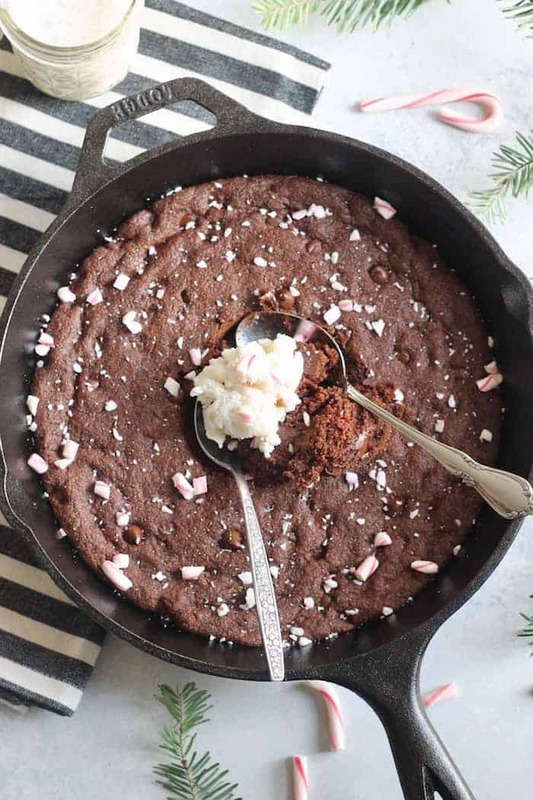 Because that’s how fantastical this Vegan Peppermint Chocolate Skillet Cookie is. It’s next level delish and worthy of a queen!! Want to know how I ate this here cookie? Okay fine I’ll tell you. I didn’t cut it into nice slices like a normal human, heavens no. I took a big spoon and proceeded to eat it directly from the middle, melty chocolate chips and all. IT WAS EVERYTHING. PSA: I found the most baller all natural mini candy canes at Target for super cheap and they add the best crunch to the top of this massive cookie. I also got my Lodge cast iron skillet there and I’ve been cooking everything it is. I love that it’s pre-seasoned! I was scared to use it for so long because I didn’t know the ins and outs of cast iron but now I feel like a champ with it. For all my pals without stand mixers, this handheld one does the trick just fine. Let it rain candy canes!!! If you’re not vegan, go ahead and use a regular egg and regular butter. No harm done! You can also really use whatever flour suits your fancy (within reason—no, coconut flour will not work here). If you’re gluten-free, I’m nearly positive Bob’s 1 for 1 GF baking flour would work wonders. I used white whole wheat flour from Trader Joe’s for a little whole grain punch but all purpose would also be lovely. You must must must must eat this will vanilla ice cream!! It’s a non-negotiable. Nada Moo vanilla is my absolute favorite because it’s made with coconut milk and super creamy but not crazy high in sugar. 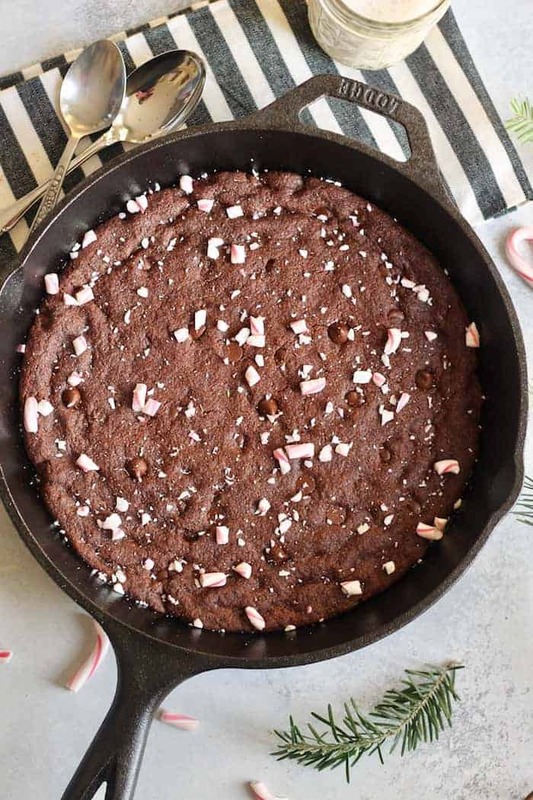 I’m so freaking excited for you to make this epic Peppermint Chocolate Skillet Cookie. I think it’s Christmas morning breakfast material! Praise hands emoji all day. Ugh chocolate is my love language. Preheat oven to 350F. Grease a 9-inch cast iron skillet. If you don’t have a skillet, use a round pie pan. Whisk together flax and water in a small bowl. Set aside to thicken. In a large mixing bowl with electric beaters (or In the bowl of a stand mixer with the paddle attachment), cream the vegan butter and both sugars until fluffy, about two minutes. Add vanilla extract, peppermint extract, and flax mixture and mix until combined. Add flour, cocoa powder, baking soda, and salt. Beat until a dough forms. Stir in chocolate chips by hand. Spread mixture into prepared skillet. Bake for 18-20 minutes or until center is set. Cool for 15 minutes and garnish with crushed candy canes. Now I’m craving a giant chocolate cookie so bad. I want this now! SAME. I want it for breakfast! 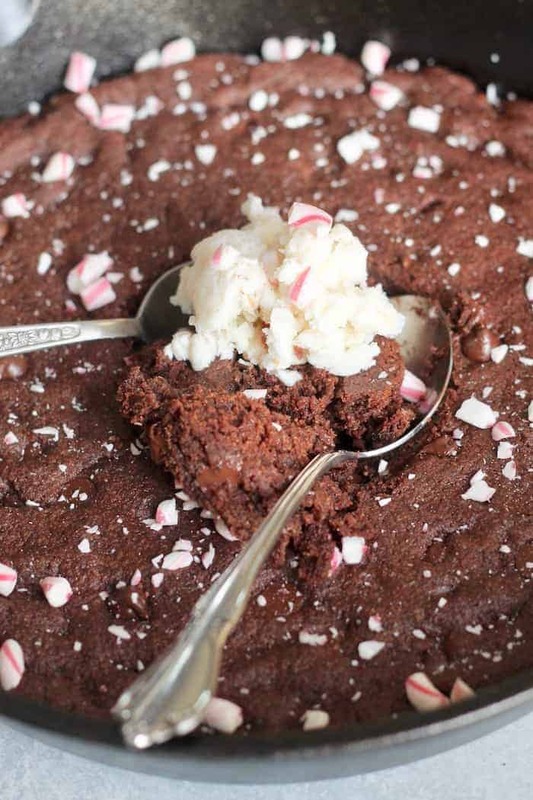 Mmmm peppermint and chocolate is my favorite combination this time of year! This looks incredible, with or without a big scoop or vegan ice cream! Something about this time of year makes it extra delish! I’m dreaming of this big, warm cookie with vanilla ice cream on top. Legit drool fest! 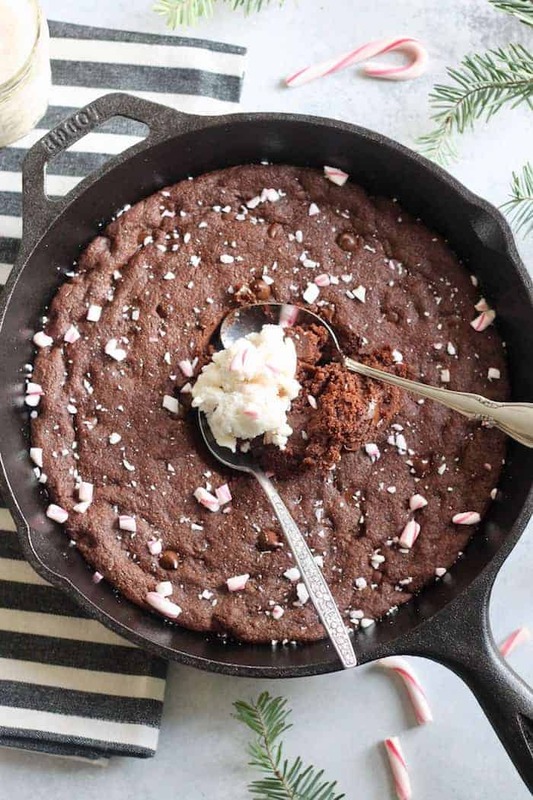 I so love the idea of making a giant cookie or pancake in an iron skillet. Such a perfect presentation, and heck yes to digging into the center with a spoon! Is there even another way to eat it? haha Looks awesome, girl! Haha not in my book! It’s the best because you hardly have to wait for it to cool. Less waiting time to have dessert is always a win! You turned the season’s best flavors into a skillet cookie. And I kinda sorta love you for it. Not in a weird way, just in a, “Wow I really cannot wait to eat this” kinda way. Ya know? Oh wow you’re giving me all the heart eyes right now! Talk about cookie heaven! Love the peppermint twist! Right?! My entire house has turned into cookie heaven this month. Can’t get enough!! HI there – I just made this recipe tonight and it tasted really good. purchasing a starter home, your dream home or an investment property. truth however I’ll definitely come again again. I was looking at some of your posts on this website and I think this site is real instructive! you for that professional assistance I have enjoyed checking out your site. never have been complete without visiting your blog. Sweet site, super pattern, really clean and utilize pleasant. Your site offered us with valuable information to paintings on. You’ve done an impressive job and our entire community will likely be thankful to you.